Douglas Wilson. 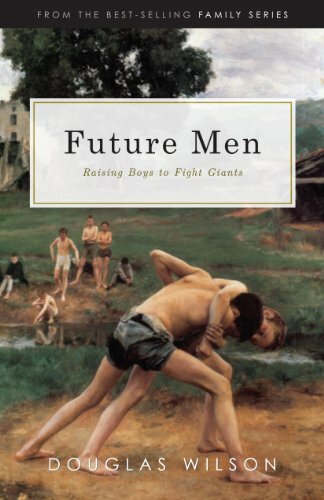 Future Men: Raising Boys to Fight Giants. Moscow, Idaho: Canon Press, original 2001, revised 2012. 199 pp. $15.00. Sometimes I am proud of myself. I’m proud because in the morning I woke up on time, put on my pants, read my Bible, and went to work. Then after work, I come home to the same woman I left in the morning—the woman I love and that loves me. Also, I played with my children and we ate dinner together. I’m proud because throughout the day I was—by most standards—a decent citizen, father, and husband. From pants on to pants off, I did a few things that are commendable. Then I re-read Future Men by Douglas Wilson, and I remembered that the bar is higher, much higher. Biblical manhood is like a book on the very top of a giant bookshelf in the library—you know, the shelves that need a ladder to be reached, and when someone actually does reach them, the books are dusty through neglect. That’s like biblical manhood. Yet I should be clear: it’s not just Wilson that sets the bar high. In the best possible way, Wilson and Future Men are derivative. In Future Men the Bible sets the ideal first. And just as in the Bible, Future Men is not merely full of unattainable ideals. The book is also full of empowering grace—a ladder, if you will—to reach up to the top shelf. Okay, Wilson, liberty is for holiness; I get it. See what I mean? It’s hard to label, hard to pin down. Liberty is for holiness, but fathers should teach their sons to drink (in a way that brings glory to God, no doubt). Future Men covers topics from sexual sin to money; and doctrinal meat to friends; and formal (Christian) education to effeminacy. Throughout the whole, readers will find zero footnotes and only passing references to other sources, which is actually a fresh treat to those that read a lot of non-fiction. But this (i.e. having no footnotes) doesn’t mean Wilson is not listening to the conversations of the world; he is. He’s simply not telegraphing it. If I was to offer a critique of the book, at several points the topics seemed packed more tightly than the space allowed. This was especially true of Chapter 15 (“Fighting, Sports, and Competition”), which felt rushed and crammed. One other thing to mention: Wilson is feisty, and at some point in the book, I promise you’ll be offended. It might even happen several times. That’s good; it means you hold your opinions strongly enough that you can recognize when they’re being critiqued. The real question, however, is a fundamental one: What do we do with our offenses? Are we humble and honest enough to investigate the scriptures to see if we are wrong? Or are we only looking to books, any books—the Bible included—to merely see our own convictions reaffirmed? No surprise here, the echo-chamber approach has problems. But, for those who need a reminder that “the bar” of biblical masculinity is high—and reaching up to it is always a supernatural endeavor through the grace of Jesus Christ—Future Men provides this kind of reminder.